It’s been an incredibly busy Christmas week for us, and yesterday, as Seth and I were driving home through Downtown Lake Worth from some errand or other, we passed by a house that had a rather large animal grazing in the front yard garden beds. I did a double take because at first sight I thought it was a small bear. But we both came to the realization a moment later that it was, in fact, a big pig. It was the first time either of us had seen a pig that size in Lake Worth, but we were not terribly surprised, for our longtime motto has been “Keep Lake Worth Quirky,” and the sight of a big bristly pig grazing unattended in a front yard is just part of what makes Lake Worth, well… Lake Worth. Which on this day to be served is. Aside from the Queen’s College story and our old Boar’s Head Carol, there are other associations between the boar and these darkest nights of midwinter. Pigs were especially sacred to the Celts, for they provided the winter’s meat and the belief was that pigs were a gift from the underworld. And in the Scandinavian countries, Frey, the sun god, rode across the sky on a boar with golden bristles that shone like rays of the sun. There is, as well, a fun old carol that is sung by the Revels children’s chorus. It’s all about animals, but it begins with a pig. Seth and I were singing it just last night, in fact. I don’t even know why. Perhaps it is just the persistence of memory and the timely reminder that the focus for this next day of Christmas would be on the boar. On Chris-i-mas Day in the morning. And so on it goes with crows and sheep and drakes and minnows. But it is the pig this Fifth Day of Christmas that steals the show. Whatever your feast may be this day, I pray you, my masters, be merry, quot estis in convivio! 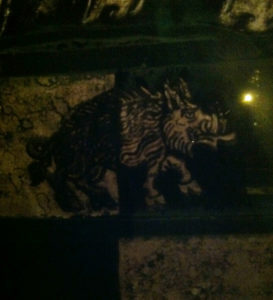 Image: Seth discovered this image of a wild boar depicted in one of the stained glass windows at Bethesda by the Sea Episcopal Church on Palm Beach. We don’t go there very often, but we do make it one of our stops on our annual Maundy Thursday pilgrimage to three churches. Each year we visit this boar, like an old bristly friend.